28 March 2017. Brussels. The annual Forum for the Future of Agriculture (FFA) stimulated debate on the future of European and world agriculture. 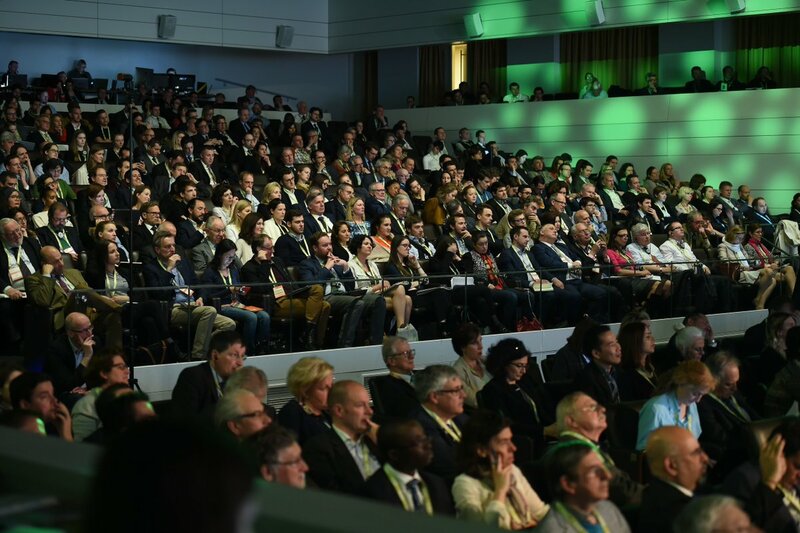 FFA2017 (with more than 1,700 participants) extended a broad-based call to action to businesses, politicians, farmers and civil society. A call to focus on the practical issues of implementation; a call for leadership from all stakeholder groups, including a commitment to cooperation and collaboration, which will deliver comprehensive benefits throughout the value chain, from the farm to the dinner table. “If we want to achieve the Sustainable Development Goals, the time for solutions is now. There is no time and no need to wait for others to move. 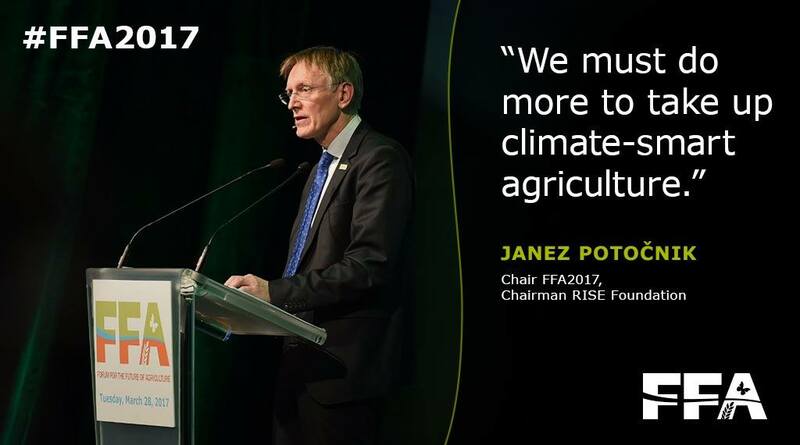 At the FFA, we aim to inspire the leadership and on the ground changes that are needed.”Janez Potočnik, Chair FFA2017, Chairman RISE Foundation. 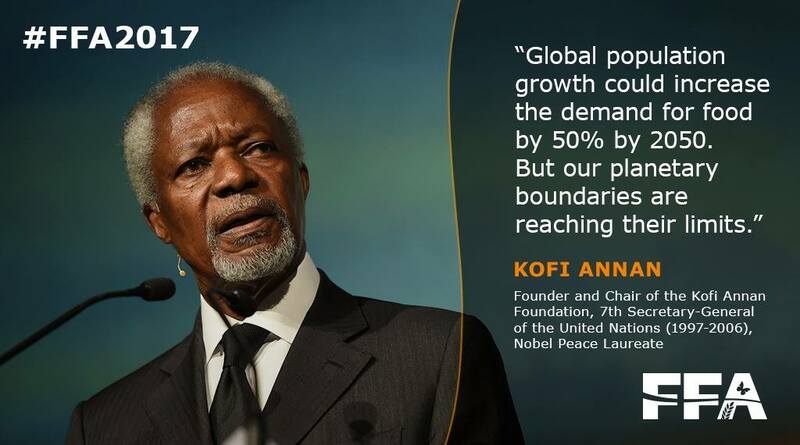 “Shifting to sustainable food systems and agriculture to feed the world and deliver wider goals of development demands sustained and bold leadership from every sector.”Kofi Annan, Founder and Chair of the Kofi Annan Foundation, 7th Secretary General of the United Nations (1997-2006), opening keynote address. “Current food systems are inherently wasteful, and increasingly challenged by rising demand and loss of soil productivity. 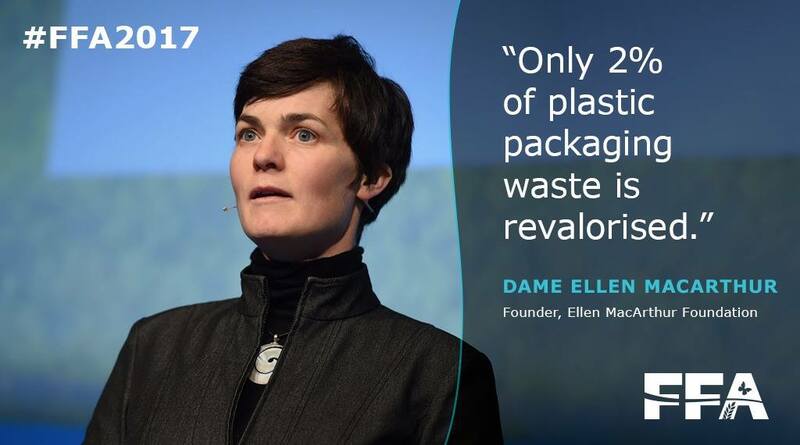 Moving towards regenerative practices, underpinned by circular economy principles, would help create more value and rebuild natural capital.” Dame Ellen MacArthur, Founder of the Ellen MacArthur Foundation, afternoon keynote address. Question 1 – Time for solutions: Rebooting the system? We need global actions that break through these silos so that we can tackle global problems that will have as much impact on you and me as it will on a farmer in Haiti or a factory worker in China. Unless we become fully aware of the interconnected nature of our lives in the 21st century, and get the governance structures to match, we have no hope of achieving the UN’s Sustainable Development Goals (SDGs) and of living within the planetary boundaries. The SDGs, which were ratified in 2015 and represent seventeen major policy areas, range from affordable and clean energy to ending hunger to sustainable use of our oceans. The SDGs recognize that today we are all connected in a kind of a global village, and that everybody must play their part. Under the SDG agreement, the EU and your government have committed to one hundred and sixty-nine targets to guide them; a list set out by the world’s best thinkers and scientists. If that sounds very long and complicated, it is because the challenges we face today are not simple to solve. Question 2 – Time for solutions: Is the CAP fit for delivering the SDGs? The Common Agricultural Policy is the EU’s most developed sectoral policy which provides crucial support for agriculture and the rural environment in Europe. The CAP has always adapted to the changing challenges faced in Europe. For the next decade or two one of the most critical challenges is climate change which threatens agriculture. We must equip farmers with the knowledge and capacity to reduce emissions, to contribute to sustainable renewable energy production, and to adapt to whatever climatic conditions they encounter whilst continuing to supply our food. The technical challenge faced by our farmers is immense. Europe rightly demands reasonably-priced, high quality food, with world-leading ambitions for environmental protection and animal welfare. In addition, we want our farmers to carefully steward natural resources, offer flood protection, maintain and even enhance biodiversity, and provide the cultural landscapes for our rural holidays. All this whilst remaining reasonably competitive in supplying food in highly volatile market conditions. This are tough demands, and farmers can reasonably expect that the generously-funded Common Agricultural Policy should help them rise to these challenges. The RISE Foundation invited a small group of experienced CAP analysts to think about how the CAP can be further modified to better help farmers rise to these multiple challenges. 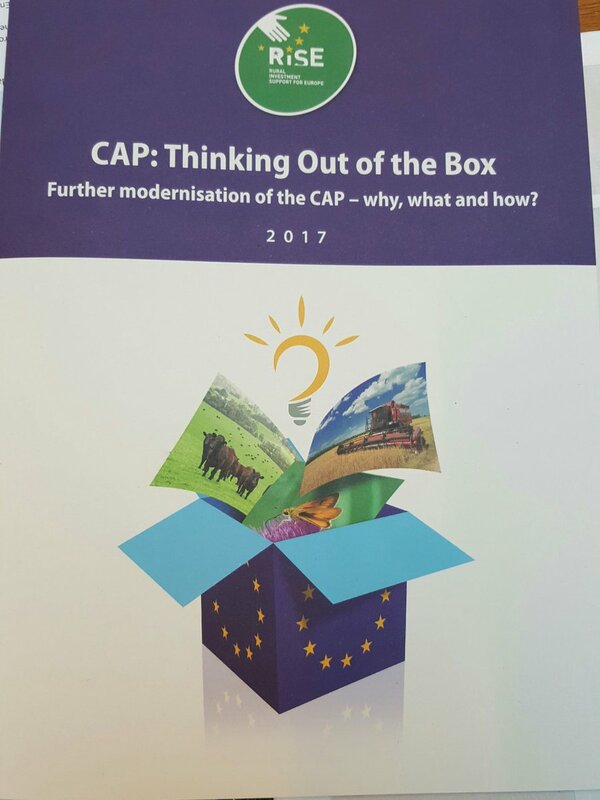 The report of the RISE CAP Reform group will be presented as part of the Forum for the Future of Agriculture at a launch event on March 27 in Brussels and as part of the conference on March 28. The RISE report tries to suggest how this complex jigsaw of land and risk management supports can be combined with the best of the existing rural development supports and perhaps new ways of encouraging and supporting transition. It also considers if the current policy decision making procedures could be better structured to maximise the chance of constructive dialogue between the main stakeholders in agricultural policy to work together. Question 3 – Time for solutions: Is the circular economy an answer? With more than half of the global population living in urban areas, the role of cities in food production is becoming more important. Consequently, so is urban food waste and nutrient recovery. In the urban context, nutrient recovery from municipal solid waste and wastewater systems is a typical feature of circular economy solutions that offers huge potential. After collection and treatment, nutrients could be returned to the agricultural system and therefore also contribute to displacing a proportion of synthetic fertilisers, while at the same time producing energy through anaerobic digestion or biorefinery (see the Ellen MacArthur Foundation’s scoping paper, “The Urban Biocycle”, March 2017). “This would provide clear benefits of up to 5% CO2 reduction and a 10% decrease in synthetic fertiliser use by 2030” states the Achieving Growth Within report. Combining these different approaches with the best of traditional farming shapes a coherent circular food system that has the significant potential to revitalise ecosystems, reduce CO2 emissions and produce healthy and nutritious food. These sets of opportunities could also make a substantial contribution to job creation, and if successfully applied, could generate an economic benefit of hundreds of billions of euros. The time is right to initiate such a shift, which will need concerted stakeholder action, regulatory adjustments, innovation and dedicated investment strategies. 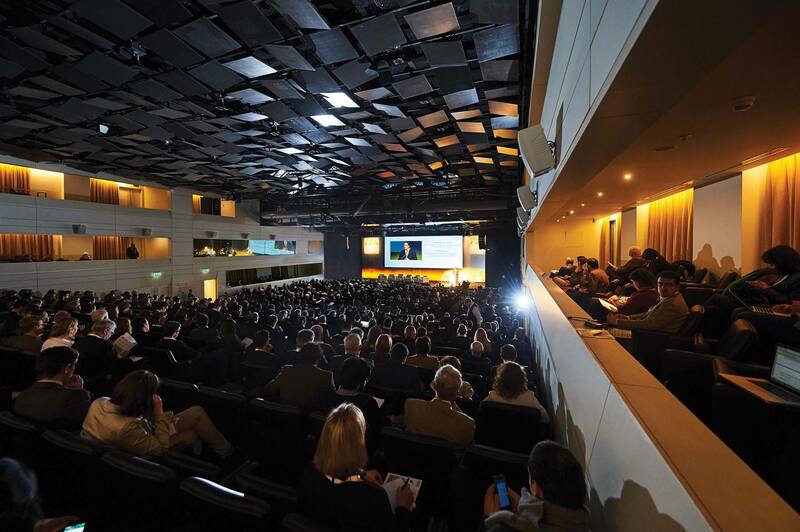 The annual conference of the Forum for the Future of Agriculture takes place every spring and it has a program of activity focused on the food and environmental security agenda. The FFA Brussels is accompanied every year by regional conferences across Europe. The purpose of the FFA is to stimulate open discussions on the future of European and world agriculture and assess what should and what can be achieved over time, attaching equal weight to two challenges: food security and environmental security.